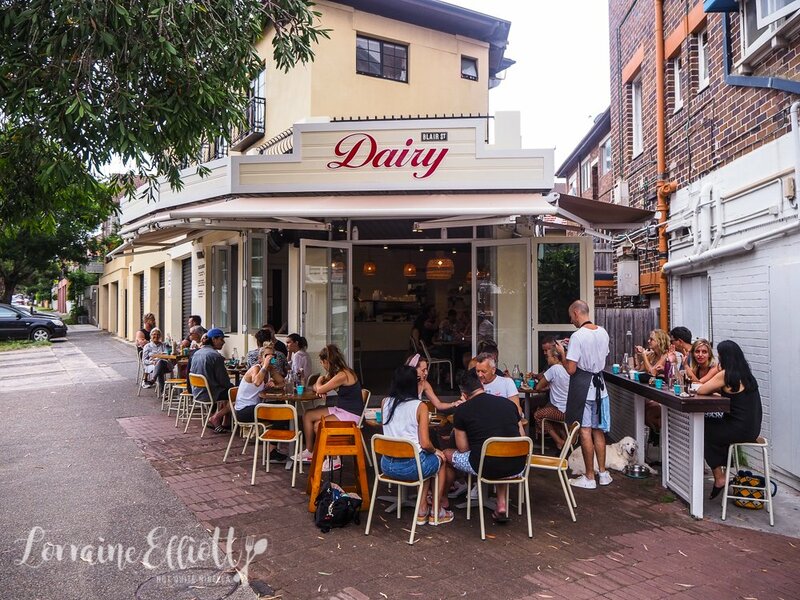 Blair Street Dairy is the new sister cafe to Bennett Street Dairy also in Bondi. 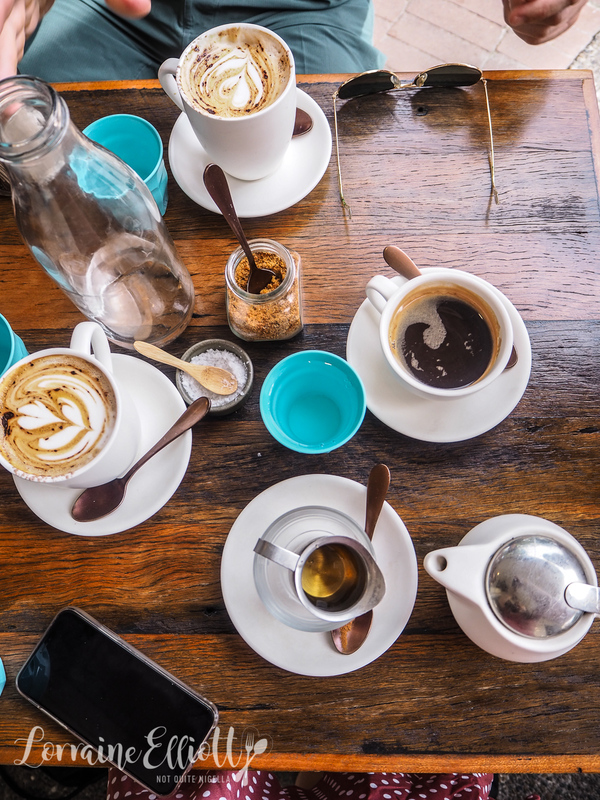 This one has more outdoor and dog friendly seating but the same menu full of big plates piled high with breakfast or lunch. Blair Street Dairy was a recommendation from Nina. And if there's one thing I know, is that if Nina recommends a breakfast place it will be good. Because while she doesn't really dabble in dinner, breakfast is her forte. The Dairy in the name is more for the notion of wholesomeness than any actual attachment to a dairy. The dairy refers to the New Zealand "dairy" or corner shop, a nostalgic site of wholesome childhood memories. Service is friendly and prompt. 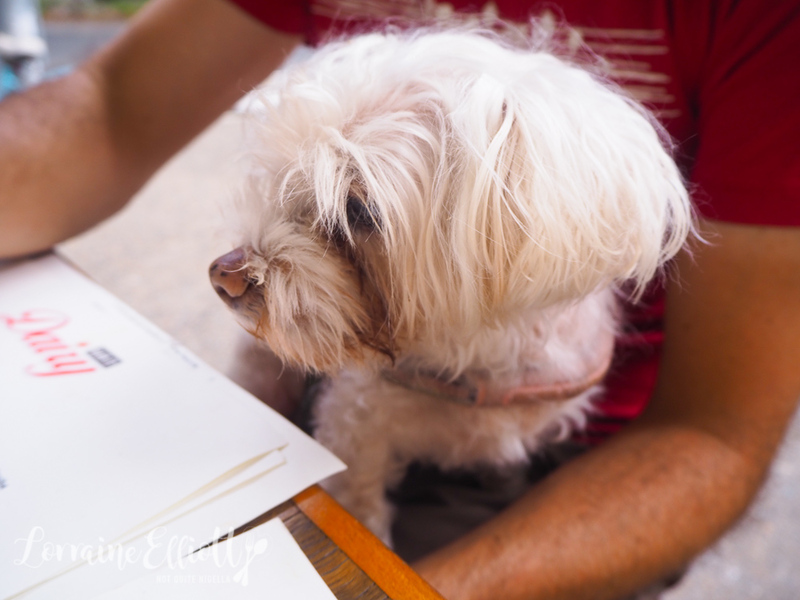 There are also plenty of outdoor tables so that bringing Mochi was easy although we are all squeezed around one small table really meant for two. The breakfast menu goes all day but the lunch menu (which admittedly sounds really tempting) starts at 11:30am. Because we are dining at 10am we order breakfast. Drinks are ordered and then finished before the food arrives (which works for table space I suppose). The drinks offering is really Bondi or actually Sydney. There is kombucha, a whole coconut, cold pressed immunity juices and turmeric lattes along with coffee and tea. I really like the chai latte. It's not a powder which is good but made from sticky chai leaves in a pot. There's also a small pot of honey and a line of cinnamon on the spoon so you can control the level of sweetness and spice to it. When they sat down the first plate in front of us my eyes widen. "My god, that's like an American sized serving," I say bracing myself for all the food. My stomach takes some time to wake up and I can only eat a little at breakfast while at dinner I can eat more. Nina tells me that she is the opposite and will happily eat an enormous breakfast and small dinner (which is really the healthier way to do things). Nina's choice is also the item I wanted to try. 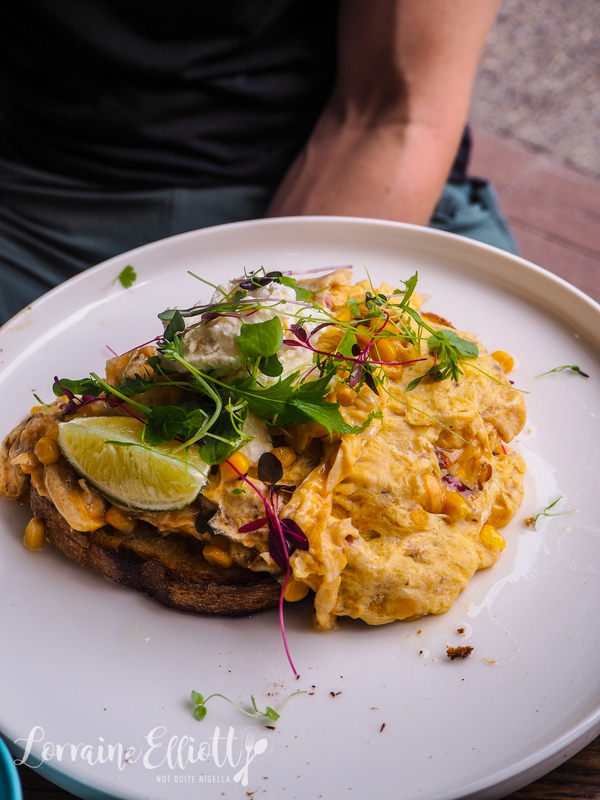 It's a slice of sourdough bread topped with spicy chilli scrambled eggs, toasted corn, ricotta, lime, truffle oil and micro herbs. Nina comments that it's on the verge of being too spicy which excites me a lot because I often find things not spicy enough. It's so good that I help myself to seconds (I asked first ;) ). The Eggs Bennett Street is their version of an eggs benedict. 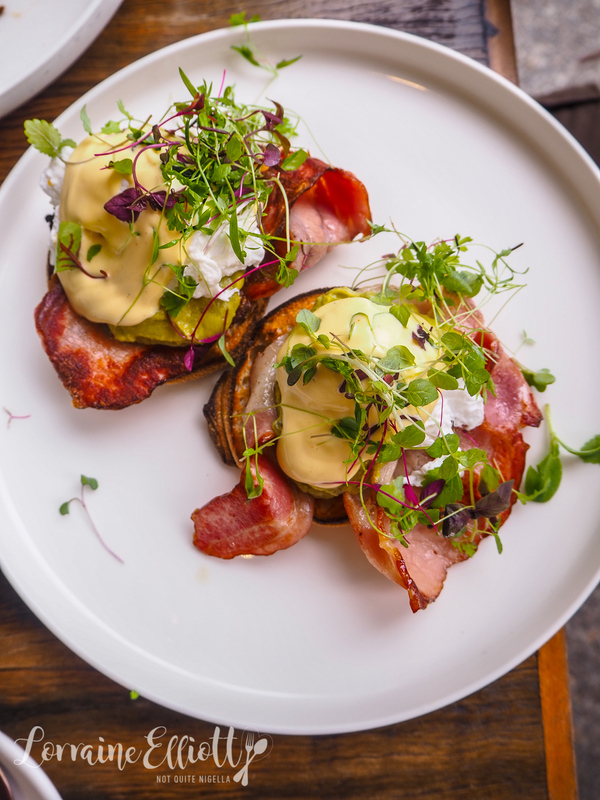 There's poached eggs, guacamole, micro herbs and just enough bacon on English muffins. I ordered it mainly because I wanted to try one ingredient: jalapeno hollandaise and it's fantastic. Tangy and spicy it brings the whole dish together. 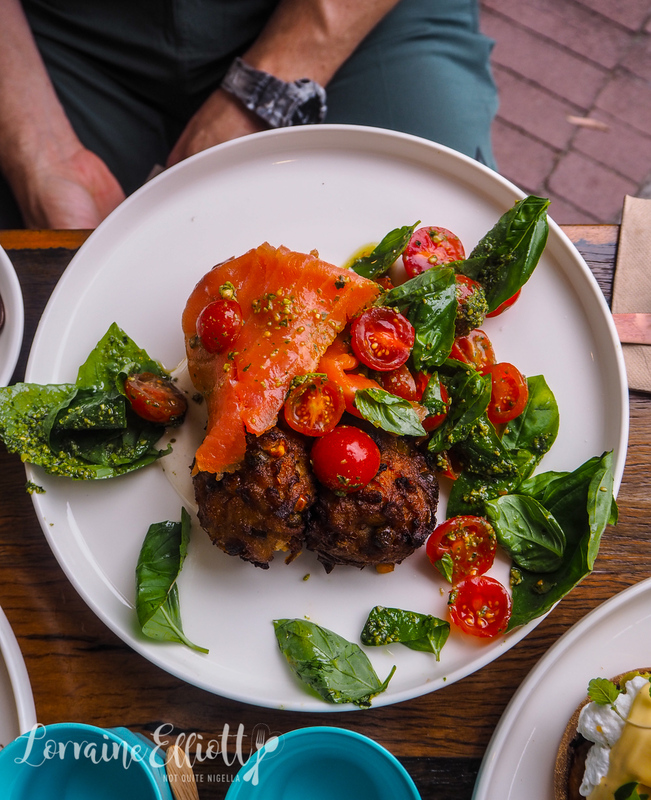 The corn and vegetable fritters come three to a serve and are crispy on the outside and soft on the inside. They are paired with tahini yogurt, tomato and basil pesto salad, avocado, onion jam and bacon or salmon. We went with the latter which was a generous portion of salmon ($1 extra but worth it). The last item is really more dessert which I don't think Nina quite approves of but then again I found out last year that she eats croissants so I don't feel as bad ordering something sweet. 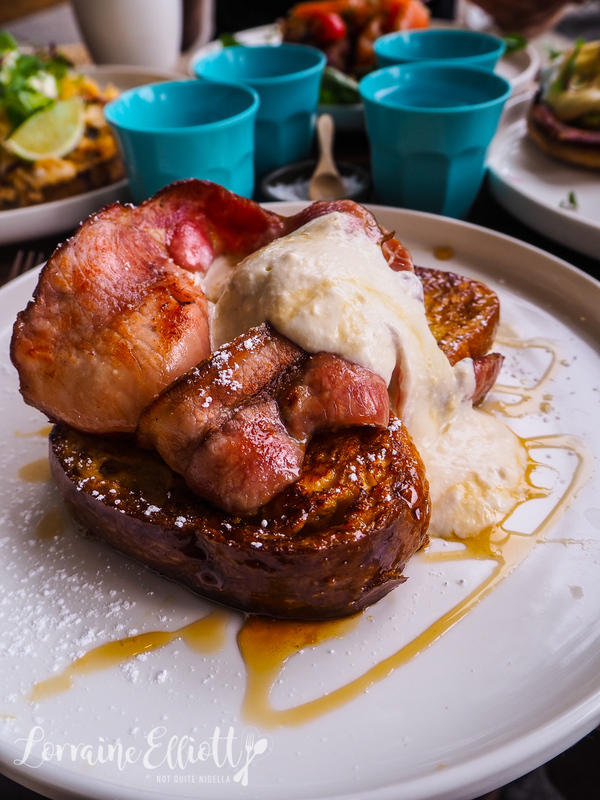 The brioche French toast is a fat slice of soft, buttery brioche topped with smoked bacon, slices of poached pear, Canadian maple syrup, whipped ricotta and mint. "I don't understand maple syrup and bacon," says Nina furrowing her brow. "I do," I say tucking in eagerly and enjoying the soft buttery bread, syrup and bacon. So tell me Dear Reader, do you wake up hungry or does you stomach take a while to wake up? Which is your biggest meal of the day? And do you understand the maple syrup bacon combo? 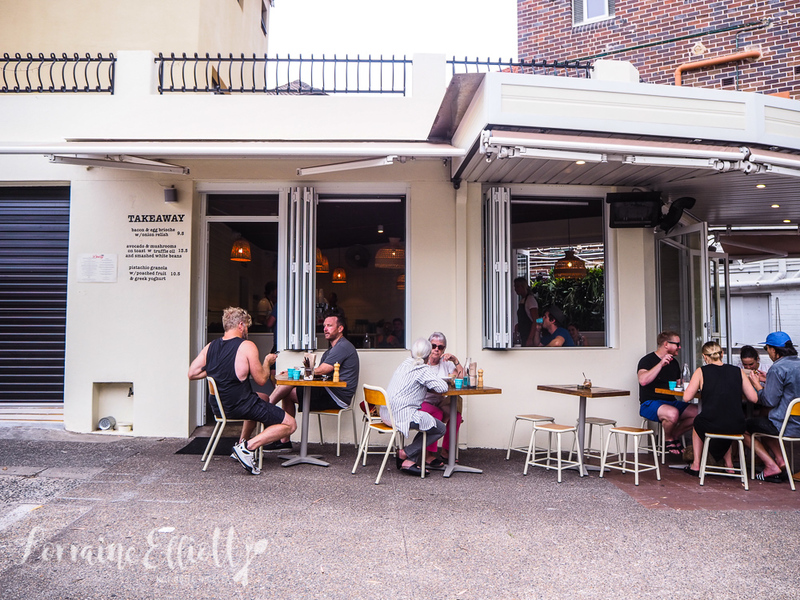 restaurant3 Delicious Bondi Beach Hot Spots for a Summer Weekend! restaurant 3 Delicious Bondi Beach Hot Spots for a Summer Weekend!